Biji Living @ Section 17, PJ is a freehold apartment located above exciting commercial spaces. Situated in an established commercial hub, Biji Living offers integrated amenities and facilities including a state-of-the-art. So it is with biji, a Malay word for 'seed'. Tiny, insignificant it might be but when lovingly and properly nurtured, a seed will reach its fullest potential like a tree planted by a stream. Carefully and meticulously designed, it will help transform and gentrify the neighbourhood, refreshing it with vibrancy and new life. A seed of an idea is all it takes to ignite a big, great plan. 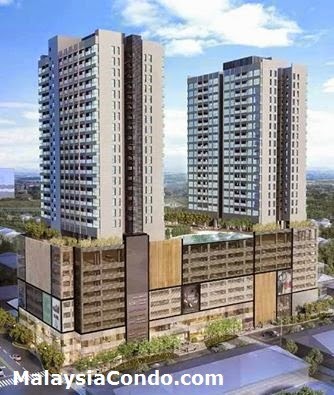 There will be 2 floors of retail shops with AEON Maxvalue as anchor tenant. The service apartments housed in two blocks a total of 425 residences. Knock on solid timber doors with chengal frames, walk on beautiful grain merbau timber flooring, exult in rain bath showers, cook and entertain in the quality kitchen. Sizes from 550 sq.ft. to 1,095 sq.ft. Built-up Area : 550 sq.ft. - 1,095 sq.ft. If you interested to registered, kindly call/sms/whatsapp James Ang at 012-3721201 for registration.